We’re off and racing for another year. 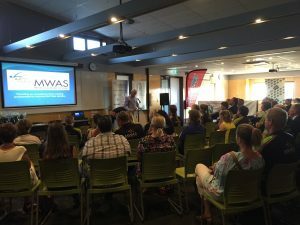 The MWAS opened our third year of providing scholarships in the Mid West with a presentation evening on Friday 12 February. The event was held at the Geraldton Universities Centre (GUC) and was attended by 60-70 people including scholarship recipients, invited guests and families. The MWAS was pleased to welcome a number of local politicians to the event. Showing their support for the MWAS were the Hon. 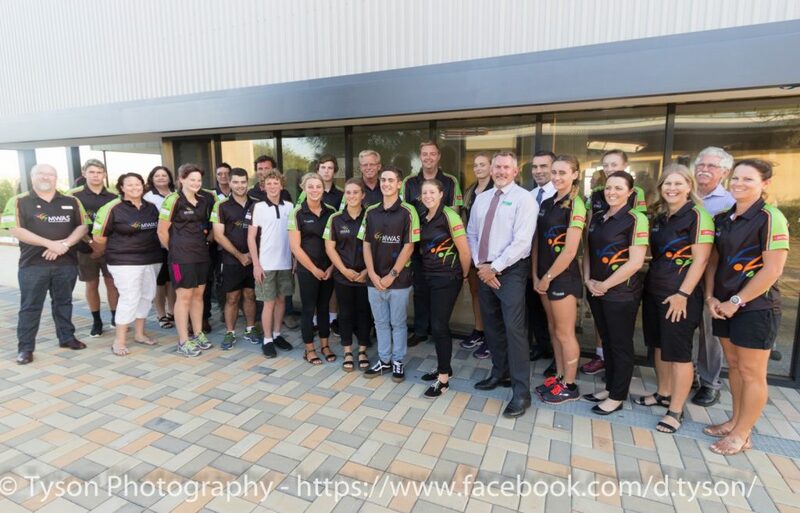 Paul Brown MLC who was also representing the Minister for Sport Mia Davies MLA; Melissa Price MP the Federal Member for Durack; Shane Love MLA and the Mayor of the City of Greater Geraldton (CGG) Shane Van Styn. The scholarship holders and guests heard positive messages from both Paul Brown MLC and the Mayor of CGG Shane Van Styn. The Mayor recognised the value of the MWAS to “bring people together as a community and to make us proud”. He encouraged each of the athletes to be a “leading light in the community”. 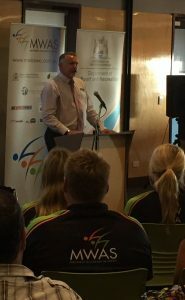 These sentiments were endorsed by Minister Brown who noted the real value of “providing young people and coaches the opportunity to develop skills without having to leave home”. Minister Brown presented the scholarship certificates along with a gift. According to MWAS CEO Martin FitzSimons the gift was a practical and symbolic gesture “The drink bottle, training towel and memory stick represented the physiological, physical and knowledge components of sport. The recipients can use all items in a practical way every day to help their sporting development” he said. A total of 30 scholarships were delivered on the night to 12 athletes, 15 coaches and 3 officials, from across 10 different sports. The MWAS will continue to work with local and state sporting associations to consider other athletes who may meet the criteria for a MWAS scholarship. Athletes receive “value adding” specialist services including strength and conditioning, sports psychology, nutrition and life skills education. Regional sporting associations are encouraged to contact the MWAS if they feel they may have such an athlete in their ranks.